31 Oct Where are the Victorian lambs? Reduced lamb throughput across all states this week saw prices rise across the board for sheep and lamb markets. 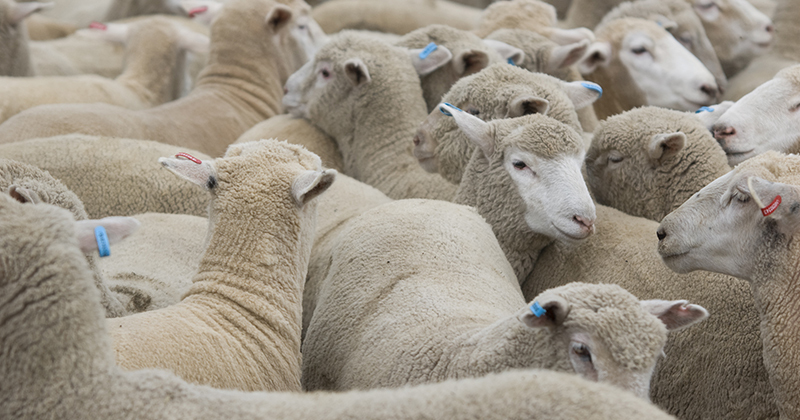 The Eastern States Trade Lamb Indicator (ESTLI) demonstrated the apparent supply shortage with a 51¢ gain to see it close yesterday at 788¢/kg cwt. The biggest drop in lamb yardings was reserved for South Australia, with a 24% decline noted in saleyard numbers this week, but all states posted a fall. The curious situation is the flat line of Victorian lamb throughput this week. This is the time in the season when numbers should normally be starting to swell (Figure 1). Victorian lamb yarding levels are running 13% below the seasonal five-year average for this time in the year and at 49,302 head, it’s a whopping 34% lower than the same time last season. The reduced supply of lamb across the Eastern seaboard is having an impact on east coast throughput with the trend dipping back below the lower end of the normal range for the first time in over four months (Figure 2). East coast lamb yarding levels are trekking 15% below seasonal average levels and the lack of supply is evident in price activity this week. The NLRS reported eastern states daily indicators posted price gains across all categories of lamb ranging between 25-85¢, with Heavy Lamb managing to break back above the 800¢ level to close at 825¢/kg cwt. Even east coast mutton managed to lift 14¢ on the week to close at 466¢, that’s despite sheep yarding levels on the east coast remaining elevated. 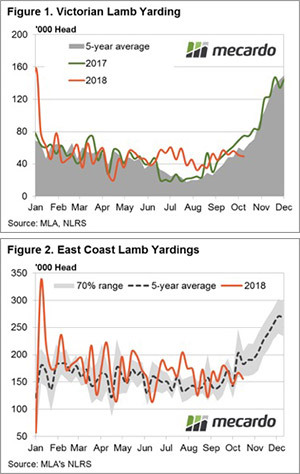 Indeed, east coast mutton throughput is running 48% above the five-year average for this time in the season with NSW and Victorian saleyards the key contributors to the additional supply. The Bureau of Meteorology released their updated rainfall outlook yesterday and it paints a dire picture for November with most of the country expected to have a drier than normal end to spring (Figure 3). If this isn’t enough to shake out any remaining lambs in the next few weeks then I’m not sure what will. Expect to see Victorian lamb yarding levels start to swell in the coming month and this is likely to put a cap on further price gains in the ESTLI for the short term.